DETAILS Any pot that is going to get wet needs to be sprayed or painted with a protective polyurethane coating before and after you paint it. Cover every nook and cranny, including the drainage hole. Otherwise your paint may bubble and crack. This is not an "all in one sitting project." You'll be putting on base coats that will need to dry, so plan your time accordingly. If you're only going to have a day with your grandchildren, prepare the pots in advance so that all that is left to do is the final design. 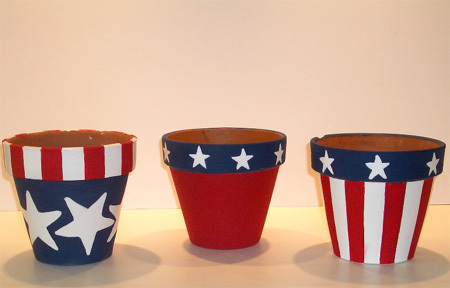 Pictured are some ideas to get you started, but think red, white and blue, stars and stripes and go for it. If it's important that your stripes be even, you'll have to measure and draw lines. But wiggly stripes can be effective too. Think about the effect you want to achieve before you begin. We'll give you some star templates of varying sizes, the rest is up to you. I think I'll use mine on the picnic table where we'll be having our fourth of July dinner, filling them with blue and white lobelia. Click for small Stars Template. Click for large Stars Template.